The 2013 “as official as it gets” Pacific Northwest Corgi Picnic was Saturday, August 10, 2013. It was our biggest yet, and it was awesome. Well over 125 people and a corresponding number of dogs. In our back yard. The weather cooperated (though unfortunately road construction did not), and a good time was had by all. Auction: We raised $1,657 for CorgiAid! Photos: I’ll post links to the various collections as I hear about them. 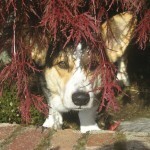 DEVYN AT THE PACIFIC NORTHWEST CORGI PICNIC! As always, updates on https://corgwn.com and http://pnwpicnic.com.